It's a tricky business, ghost trapping. Ghosts have a funny way of not showing up when you want them, but instead creeping up on you when you don't. When you're alone in the house late at night, minding your own business, that's when you're likely to hear the unexplained footsteps, walk into a cold spot, or feel invisible fingers touch the back of your neck. When you're actually trying to find them, they can hide silently for days, even weeks. The ghost at Treadwell house, fortunately, did not keep us waiting long. ❤ It's funny! Especially Ellie's little comments and asides all through the book. ❤ It's awesomely scary! What's haunting The Treadwell house down in Savannah, Georgia is mysterious, malevolent. dark and completely terrifying. ❤ The ending doesn't disappoint! Some ghost stories just peter out at the end, leaving you with a lot of unanswered questions. Or else, the ending feels unfinished and unsatisfying. 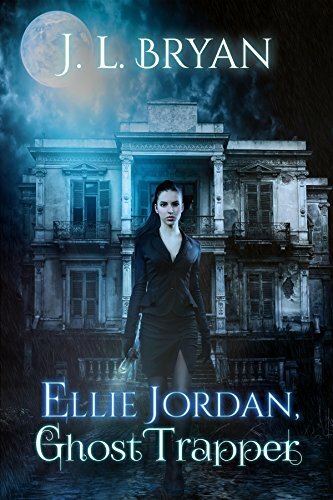 But Ellie Jordan, Ghost Trapper by J.L. Bryan doesn't do that. The ending of this book is awesome. ❤ Plus, it has great characters. I really liked Ellie and Stacey, her new, untested ghost-trapping partner; I also liked Jacob, the psychic/CPA who helps them out on this case. Which makes me even more excited to read the next book in this series. Go Ellie! I'm always up for a good ghost story! I hadn't heard of this one before, but I'm definitely going to add it to my TBR. Thanks! I haven’t heard of this one either but the nicely wrapped up ending of a ghost story sounds too good to pass up. Right? I hate the ones that just stop without really having a good ending. Oooo, it sounds like it has all of my favorite things! I'm going to have to grab a copy. I love a good ghost story, too! So why are they so hard to find? This does sound like a fun book - and I love fun books. This sounds so unique as well, I always love books that are different. Thank-you for the great review! Thanks for reviewing this. It sounds like a good one. I hate it when a ghost story sort of stops rather than having a satisfying ending, so looking forward to trying this one!